Europa, as viewed from NASA’s Galileo spacecraft. Visible are plains of bright ice, cracks that run to the horizon, and dark patches that likely contain both ice and dirt. 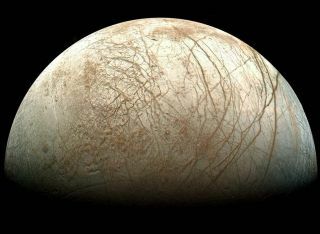 THE WOODLANDS, Texas — The equator of Jupiter's icy moon Europa may be covered with huge spikes of ice, scientists say. Astronomers have known for some time that Jupiter's moon Europa is icy, and now scientists are trying to understand just what form that ice takes by using some of the coldest places on Earth as analogues. Huge ice spikes, known as penitents, found on Earth could form on Europa, they said. "It's a pretty obscure geological feature on the Earth," Dan Hobley, an astronomer at the University of Virginia, told SPACE.com after he presented his findings at the 44th annual Lunar and Planetary Science Conference. It takes a very specific set of circumstances for penitentes to form, Hobley said. The angle of the sun has to hit the ice in just the right way to keep the spikes of ice standing on end and buried deep into the ground. The blades grow in very dry conditions and can thrive in dirt-filled or clean circumstances. As far as scientists can tell right now, all of those environments exist along Europa's equator, Hobley said. These bizarre ice and snow formations are known as penitentes (Spanish for 'penitents'). They are illuminated by the light of the Moon, which is visible on the right on the photograph. On the left, higher in the sky, the Large and Small Magellanic Clouds can be faintly seen, while the reddish glow of the Carina Nebula appears close to the horizon on the far left. Photo by ESO Photo Ambassador Babak Tafreshi. Although Europa has been observed using radar and spectroscopy, scientists have not been able to understand exactly what the surface of this moon looks like. The geological features of Europa seem "basically random," Hobley said, but the existence of penitentes could offer an explanation. Scientists have found that Europa's equator is warmer than it should be, and penitentes could explain that mysterious temperature, Hobley said. The ice spines reflect heat onto one another, creating a warmer area because the sunlight gets trapped bouncing from ice spike to ice spike, Hobley explained. The scientist and his colleagues are interested in understanding what the surface of Europa looks like, partially because it's a first step towards designing a viable lander that could safely touch down on the moon's frozen surface. But it might not be that simple, Hobley said. The icy shell of Europa's surface might shift occasionally, displacing the area of the alien world that used to be its equator. Penitentes don't naturally form in higher latitudes, so if the shell does shift, that could create a problem for astronomers trying to map exactly where to set down a lander. "We're at the state where this is a good, solid guess," Hobley said.